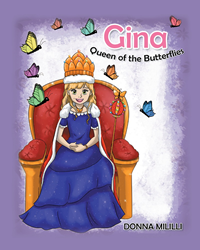 Donna Mililli’s new book “Gina: Queen of the Butterflies” is a charming story about a little girl who teaches compassion to her friend through her love of butterflies. Recent release “Gina: Queen of the Butterflies” from Page Publishing author Donna Mililli is a delightful picture book that explains how one young girl’s infatuation with butterflies serves the purpose of not only inspiring her imagination but gives her the opportunity to demonstrate compassion. Donna Mililli, a stay at home mom with a penchant for story-telling, has completed her new book “Gina: Queen of the Butterflies”, a heart-warming tale about a little girl whose playful dreams about butterflies lead to her educating her friend before she makes a dreadful mistake. Donna Mililli created this and many other stories to tell her own children, Gina and Johnny, when they were young. Their value served far beyond that of entertainment. “These stories helped to gently instill values by capturing their imagination and creativity. Teaching children to live their dreams with child-like kindness”. Published by New York City-based Page Publishing, Donna Mililli’s endearing tale introduces Gina, a little girl who is absolutely infatuated with butterflies. Many of her favorite activities are centered on expressing her love of and learning more about the beautiful winged insects. However, when her friend Suzie encounters a carefree caterpillar and intends on squishing it, Gina finds that all of her knowledge on the subject of butterflies pays off. The message of this book is as gentle as it is important: Every creature deserves an advocate, be it as majestic as a butterfly or as small as a caterpillar. Readers who wish to experience this charming work can purchase “Gina: Queen of the Butterflies” at bookstores everywhere, or online at the Apple iTunes store, Amazon, Google Play or Barnes and Noble.